What started as a typical friend gathering while playing songs together turned out to be something even greater beyond one’s expectation. 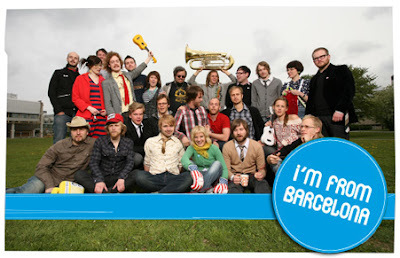 A group of around 29 people incorporating a range of instruments including clarinets, saxophones, flutes, trumpets, banjos, accordions, kazoos, guitars, drums, and keyboards in their songs, managed to create a stir amongst local music fans and not sooner after that, the Swedish press and bloggers all over the world as well. 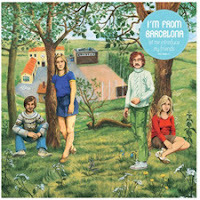 I’m From Barcelona are now well known for their massive 29 members, explosive live shows, and incredibly exciting indie pop tunes. With both an EP, Don't Give Up on Your Dreams, Buddy! and a full-length album, Let Me Introduce My Friends released last year, they’re showing no signs of stopping. The song ‘This Boy’, introduces fellow Swedish musician ‘Loney, Dear’ contributing in the falsetto parts. It’s a song like this that allows you to let loose a bit and keep your insanity intact (yes, I wrote insanity); a fun-loving, childlike pop jangle that could do no wrong. Plus there’s always something intriguing when a man sings in a high note the words that go, “…and there’s always gonna be this little girl inside of me”. I'm From Barcelona really hails from Jönköping, Sweden, (in case any of you were wondering) .